In Bonavista Apartments Barcelona we work hard to provide our customers with an honest, personalized and unique service. Our goal is the welfare and comfort of our guests. We manage directly all the apartments we sell in our website, so we can guarantee the highest quality both in the apartment and in our service. The buildings are located in centric areas well connected with public transport, and with a wide range of services. Also are safe areas, well maintained and pleasant to walk. The highest quality of service is what drives us. For us, this excellent service should be produced from the first contact with the client until they return home. Our staff welcomes guests in the apartment, not only to take a guided tour, but also to answer any questions about the city, or advise on attractions, restaurants, services, etc. From that moment on, we are available to answer any questions or to immediately resolve any customer problems with the apartment. On a daily basis, we have staff in each oth the buildings, for cleaning purposes, maintenance, and customer service. Of course, we also have a 24-hour telephone for emergencies. We are proud to know that our service and our quality standards have satisfied thousands of customers who have stayed in our apartments. Customers’ opinions are on our website, and on other sites. Visiting an unknown city can produce a certain insecurity. Is the area where I stay safe? Am I really close to the center? How does public transport work? Will I get to the apartment? Also, book an apartments may seem a risky option rather than than a hotel. Will the apartments be like in the pictures? Who is managing these apartments? Who do I call if anything happens? Can I leave my stuff in the apartment safely? In Bonavista Apartments Barcelona we are fully committed to safety. On one hand we give as much information as possible to the customer at the time of booking, we are transparent, and guarantee that the apartments meet with what we advertise. Furthermore, our buildings have efficient security systems such as surveillance cameras, security doors or safe-boxes in many of the apartments. Our main desire is that your stay in Bonavista Apartments Barcelona without any worry. Bonavista Apartments Barcelona offers spotless apartments. We are fully committed to hygiene in all aspects at all. The cleaning staff, who has been working with us for many years, is hired directly by the company, ensuring a perfect knowledge of the high standards required. Our bedding is washed in a professional laundry. The bathrooms and kitchens are cleaned thoroughly, paying special attention to the most sensitive areas. The state of the apartments is frequently audited after cleaning. In Bonavista Apartments Barcelona we believe that sustainability is an important factor in management. That is why we try to make our activity the least harmful to the environment as possible. We heve introduced sustainability measures both in the office and in the cleaning of the apartments. Some apartments already incorporate energy saving systems, such as movement detectors for lights or solar heated water. In addition, we invite our guests to recycle during their stay in Barcelona, ​​giving all the necessary information to make this easy. After several years of existing under the name of Bonavista Studios and offering accommodation in 8 apartments, in 2008 the building owners took a major reform with the objective to build 10 apartments of the highest quality. Bonavista Apartments Barcelona began in 2009 with 10 apartments of which thousands of customers have expressed their satisfaction. In 2011, Bonavista Apartments Barcelona joins it's offer 16 modern apartments in a new building located near the first, in the Gracia neighborhood. In early 2012 it incorporates a third building, in the heart of Eixample, with 8 fully renovated apartments. In 2013 we have started managing a fourth building, right on Passeig de Gracia. With a total of 38 apartments, Bonavista Apartments Barcelona has a wide range to meet the needs of the most demanding customers. 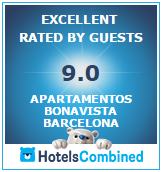 The Bonavista Apartments Barcelona staff consists of ten professionals committed to their work. If you need to contact us, you can find us on a daily basis in each of the buildings, and you can also call us or send us an email.